Breaking a promise not to cut Social Security, the Trump administration released a budget that would slash Social Security payments for disabled workers by shrinking many of the federal government’s disability-based programs by $72 billion over the next decade. Press coverage has emphasized that the budget avoids large cuts for programs that benefit mostly older workers, but this is inaccurate—especially for Social Security Disability Insurance (SSDI), which disproportionately benefit older Americans. It is true that the Trump administration is desperate to cut programs like food stamps that overwhelmingly benefit poor children, but it is incorrect to claim that the administration’s draconian budget reductions spare older people. In fact, the administration’s budget cuts are remarkably comprehensive in their cruelty across the age distribution. Cuts to Social Security disability payments will especially burden older Americans, as they are precisely the individuals most likely to be disabled. Do you know people with cancer advanced enough that it prevents them from working? Or how about a family member with diabetes or arthritis? These and other illnesses prevent older Americans in particular from holding steady employment. 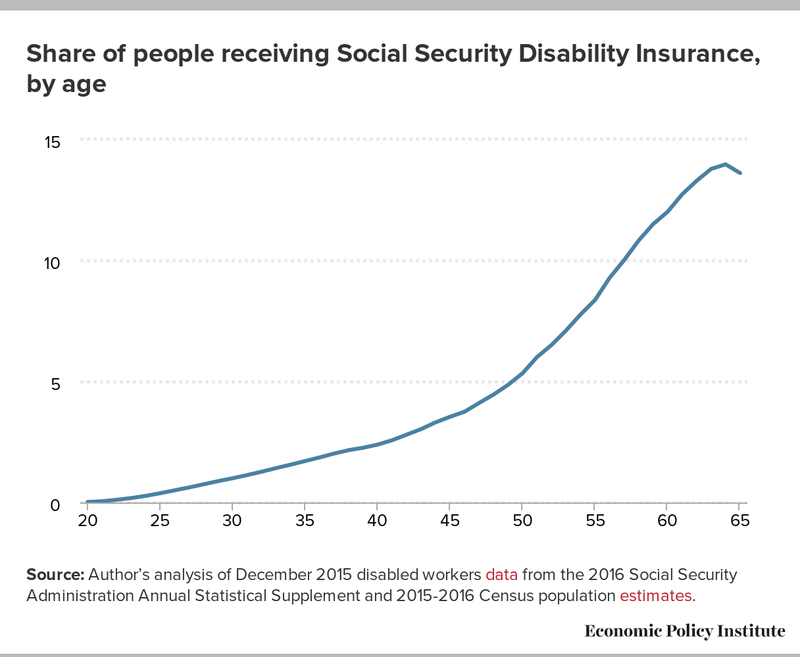 The figure below shows that the share of the population receiving disability insurance payments indeed rises rapidly with age. Nearly one-in-ten (9.9 percent) people between the ages of 50 and 65 receives SSDI, in contrast to the small shares of younger individuals receiving these payments. As a result, nearly three quarters of those receiving Social Security disability are between the ages of 50 and 65. Source: Author’s analysis of December 2015 disabled workers data from the 2016 Social Security Administration Annual Statistical Supplement and 2015-2016 Census population estimates. SSDI has long been unfairly maligned by politicians and commentators. The Trump administration claims—without evidence—that current disability payments provide the wrong “incentives and pathways to recover from a temporary disability.” OMB Director Mick Mulvaney said he “hopes” that budget cuts will sharply reduce the number of workers receiving SSDI. It is hard to argue that SSDI is overly generous. In fact, the U.S. disability insurance system is already one of the most restrictive among OECD countries. The current average benefit for disabled workers is about $1,171 per month—not quite even what a full-time worker would make earning the federal minimum wage of $7.25 per hour. Although disabled workers can in principle receive up to one year of retroactive benefits, the Trump administration’s budget proposes to cut that in half—a loss of roughly $7,000. All told, the Trump administration’s budget cuts would imperil the 10.6 million disabled workers, their children, and their spouses that currently rely on these payments.